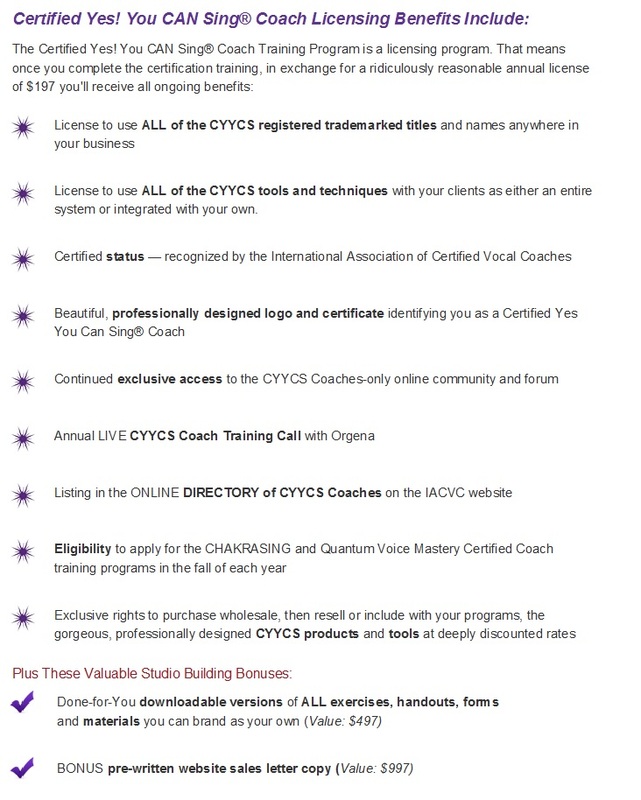 Are you ready to have your professional, powerful and purpose-filled voice studio with this amazing certification program in 90 days? This is your opportunity to not only solidify this award winning voice training technique for yourself, but be able to turn it into a financially lucrative business! 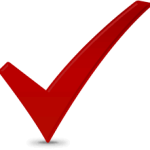 What’s Included in Your Certification Program? I have designed this program to include the best of my over 30 years of Vocal Performance, over 20 years coaching and teaching experience in colleges, high schools, for Disney and in my private studio along with my Vocal Pedagogy training, transformational coaching skills, and studio building experience. First Session Success Secrets – Know exactly what to do in your first session with your student to establish rapport and a heart to heart connection! Learn the 5 steps to deeply connect with your students so they know you really care, hear them, and most importantly can help and support them to achieve their goals! They will want to continue coming back to learn more with you. Rose Voice Method Certification – Learn the transformational step by step method that has helped thousands of people all around the world to strengthen their voice and learn how to sing. Students step into the full power of their voice and have gone from not matching pitch to singing on American Idol in 6 months as well as from working behind a desk for 12 years to national tours, Off Broadway, pageants and more! Vocal Health Kit –Learn the Top 10 Steps to keep your voice healthy-quickly and naturally.You’re students will THANK YOU as you help them save their voice and yours also! Studio Marketing Secrets– Where to find students and how to connect with them through Workshops, Online trainings and Referral programs so your studio stays as full as you’d like. What to Charge – How to see the value of what you do to price and package your coaching correctly. Learn how to avoid the biggest mistakes most people make that keeps them struggling and broke. Bigger Vision– What is your big WHY? Whether this is a part time side gig or your total focus, discover who are the people you feel called to help and how do you want to impact their lives through this work? Can’t make the calls? Please let us know any questions you have via email so we can answer them on the calls. You’ll receive a new learning module each week containing digital materials that will teach you everything you need to know about the program. They include demonstrations, exercises, tips, tools and techniques that show you the ins and outs of the program so you can view, listen and learn at your own pace. You will receive an email with your unique access to the information. You are NOT obligated in any way by submitting your application. We won’t charge your card. Once we receive your application we’ll schedule a private call with you to answer all of your questions and confirm if CYYCS is a good fit for you. Get ready for this incredible journey! So, you may be asking yourself what does this amazing training cost? The bonuses alone are valued at over $5,000 and the core training is valued at over $10,000 and I could easily charge that and it would be well worth it but I wanted to make sure this was truly accessible to you so you will receive this valuable, lifelong training for only $1997. We also have 2 installment options: 3 installments of $397 or 7 installments of $197. *Former Yes You Can Sing, Sacred Singer Students and Private Students automatically receive the scholarship! In order for each person to truly get individualized attention, we must limit enrollment to only 50 students and 11 spots are already taken! Once we reach that number we will be closing the doors. This will be the only time this year that we are offering this certification training. We don’t know when we will offer future trainings and they may not be as hands on. With 1 or 2 students, you can easily make back your investment. Don’t let this opportunity pass you by! 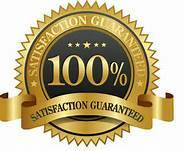 All of our training programs are covered by our 30 Day no risk money back guarantee. If in 30 Days and sincere effort you honestly do not receive any value from this program, simply let us know in writing and your money will be returned to you. No questions asked. We stand behind our program and know it will work for you if you work it. We’ll do our part and only ask that you do yours. ”See” you in the training! P.S. One of the best benefits of all is through this program you will become a better singer and performer yourself as the concepts and techniques are solidified for you as you teach others. Grow yourself, be equipped to help others! Enroll now. PPS. Why have a “side gig” or a day job that has nothing to do with your passion where you’ll be stuck punching someone else’s time clock and building their business? Wouldn’t it be great to build your own career doing something that’s in the industry you want to be in and gives you time and money freedom? No more missing great opportunities because you couldn’t get the time off. Enroll now. Doors will be closing on this opportunity soon! PPS. If you’re reading this far, there’s a reason and I believe everything happens for a reason. It’s not a mistake that you’re here. Give yourself a chance to be more successful and enroll today so you don’t look back a year from now and wish you had. I believe in you and will be with you every step of the way!